©Bert Gildart: Washington DC is a long way from the home Janie and I have made together now in Montana for almost 20 years, (our anniversary is May 4th) but not so far from a life full of many histories. We’re both army brats, and once our fathers were stationed in DC, and it is here while in high school that we first met. We’re now here to attend a memorial service for my godmother, but while in DC it is only natural that Janie and I might tour old haunts, both those of our parents and those of our own. 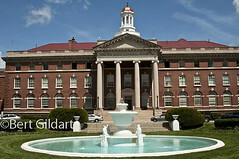 Some say the streets of Walter Reed once ran with soap; Janie’s old home at Walter Reed, now posted with keep out signs. 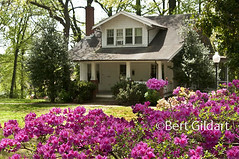 Janie’s father served as a doctor at Walter Reed and with little trouble we found her old home, just off Alaska Avenue. Rumor has it that many functions of this historic old army post may be relegated to the Bethesda Naval Hospital, and from the looks of her beautiful old home, which is now empty and plastered with “Do Not Trespass” signs, perhaps the rumors are true. The home is not far from my godmother’s, and Janie and I retraced our steps from years ago, when we would walk to her home perhaps a mile away. At the time I attended Bullis Prep School, also an easy walk in those days from Janie’s home. Today, the old prep school has moved out of town – and I doubt I could ever sneak back up the fire escape and into the dorm room after curfew, something I did often in those days – and with ease. I doubt, too, that Janie (or maybe, Ha, it was her friends??) could ever get away with dumping boxes of tide into the old fountain just outside the medical center. CLICK TO SEE LARGER IMAGES. L TO R: Roosevelt’s New Deal helped eliminate the long welfare lines, symbolic of the Depression years; Lincoln, modified into a “sepia toned” print; haunted faces as created by artist at Korean Memorial. But as well as a walk down memory lane, we also toured many of DC’s “Capitol Parks,” most notably the Lincoln Memorial, the FDR Memorial, the Korean Memorial and the Vietnam Memorial. In more reflective moments, all those memorials provide meaningful lessons, many of which are very personal. 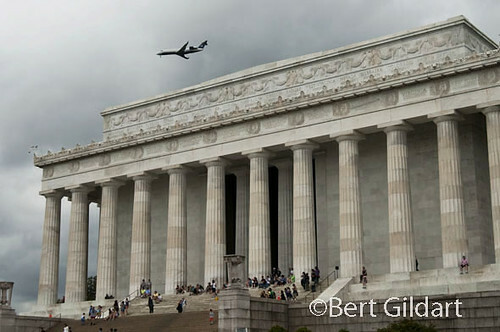 Plane over Lincoln Memorial about to land at Dulles Airport was symbolic for Janie and me. Perhaps the most dramatic image is the one with the plane flying overhead, and it seemed to symbolize all that has happened both good and bad since I left DC so long ago. Life is certainly easier back in Montana, but it is always grand for army brats to explore rootless backgrounds for added perspective on both themselves and on where we’ve come as a nation. They remind, too, that at times we have all fit into this historic American tapestry, despite “patches” that may not seem particularly significant. But that is simply not true, as the poets sometimes remind us. This entry was posted on Thursday, April 28th, 2011 at 3:49 am and is filed under National Lands, Photography, Travel. You can follow any responses to this entry through the RSS 2.0 feed. You can leave a response, or trackback from your own site.